So I have a new blog boiler plate- one of the pictures from my trip to Hatshepsut's mortuary temple at Deir el-Bahri back in 2005. The temple's name in ancient Egyptian was Djeser Djereru and translates to the Holiest of Holies. 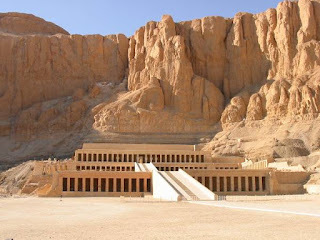 It's located just across from the Valley of the Kings, but it's even more impressive than the subterranean tombs. Of course, I'm a little biased. Hat's temple is nestled within a rock amphitheater and blends into the mountain backdrop. It's quite the architectural marvel. Sadly, the building was destroyed in antiquity, probably by earthquakes in the 1st century, but a Polish archaeological team has been working to restore the temple and is just about done. One thing you'll notice from the new blog picture is that Hatshepsut is portrayed as a man in the statue. These are Osiride statues, named for Osiris, the Egyptian god of the dead. Hatshepsut had this temple created so people could worship and pray to her after she died, hence the strange choice in gods. However, poor Hat was typically shown as a man, simply because a woman ruling Egypt was such an aberration. Unless you find an early depiction of her as Great Royal Wife (Egypt's term for queen), you'll see her dressed in a man's kilt with the Pharaoh's false beard. After her death, all her statues depicting her as Pharaoh were destroyed and dumped in a pit not far from her temple. Most historians believe this was an attempt to wipe history of a woman's rule. Out of sight, out of mind. Within the temple are stories of her divine birth and her trade expedition to the mythical land of Punt, now thought to be modern-day Somalia. The former was likely an attempt to further legitimize her claim to the throne. It's a little hard to argue against someone who claims to be the daughter of Amun, the supreme god of all Egypt. The latter was one of her greatest accomplishments during her reign as Pharaoh, bringing back all sorts of fun stuff like baboons and priceless myrrh trees. Standing outside the temple are trunks of some of those myrrh trees, preserved for all eternity. Can you imagine? Tree trunks from 3,500 years ago still preserved for gazillions of tourists to photograph each day? It goes without saying that I was in heaven while visiting Deir el-Bahri, despite the 120 Farenheit temperatures. I need to go back- they even do hot air balloon rides over the valley at sunrise!